So you have decided to flip your class, now what? For many students, the flipped model is a new concept. They are used to taking notes from a powerpoint presentation that the teacher leads them through. They have never had to take notes from a video. If you want them to be successful then they need to be taught how to do it. 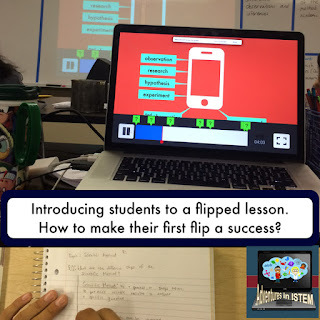 The first few times I do a flipped lesson I do it in my class. I take the class through the whole process, including going through both groups activities for the next days extensions. I start with modeling my thought process. This includes, why I added certain questions? why I included the topic and essential question for their notes? when I would stop the video, when I would rewind, and what I would do if I got the check question incorrect? I then have the students take the review quiz and we talk about the two different groups. I have the whole class go through the review groups activity and then they go through the apply groups activity. As they go through each part I explain the benefits of each part, which include moving at their own writing and processing speed, and how each group, review or apply, are beneficial and help the students. By taking them through the whole process together and explaining the why, more students become excited by this new and different teaching model and I have more success with them doing the flipped lessons. For more information about how to flip your class, check out my four part series called Fire Up Your Flip. How do you prepare your students for their first flipped lesson? Let me know in the comments below.